Anyway, I was able to park in a perpendicular street spot (one of the spots on the street that you back into and so end up perpendicular to the street) right by my last coffee stop before hitting the road to Oregon: Victrola Coffee. Now, I've never heard of the place before doing some coffee research on the greater Seattle area. But after some simple preliminary searches, Victrola seemed like a quality spot to try out and hence my companion and I had headed there right after our lunch stop at Pike's Place. On to the coffee, they roast their own beans (at their other location I deduce), with a nice variety of single origins as well as Cup of Excellence and other auction coffees. I had the Empire Blend, which came off bright and full. Their espresso, pulled expertly, had a nice chocolaty sweetness with a hint of sunshine. The teas were free leaf but I didn't get the chance to sample their quality. As one would expect of a Seattle coffee giant, Victrola gave a beautiful performance. 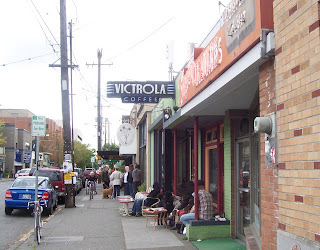 While you have a plethora of coffee choices around the greater Seattle area, I would make a point to give Victrola a go.